Not satisfied with the current display size of tablets available in the market today? 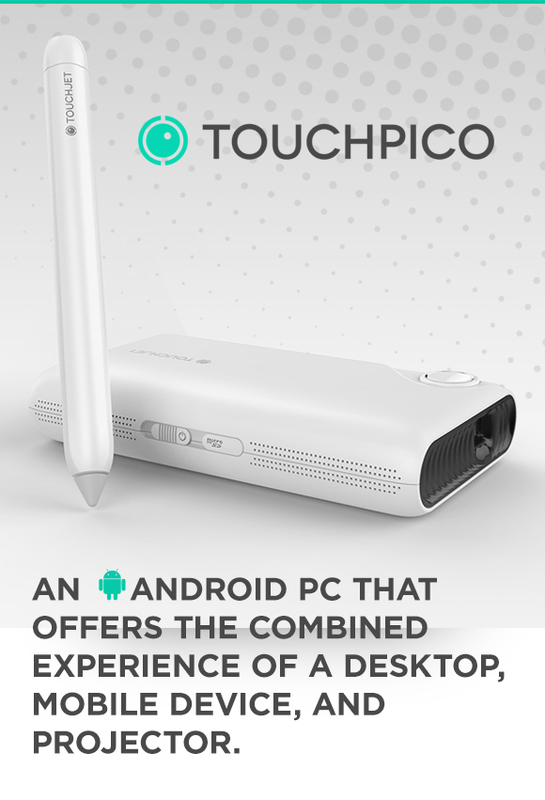 You might want to check out TouchPico, an Android powered handheld projector that can turn any surface into an 80-inch interactive touchscreen. This device allows you to play your favorite game such as Angry Birds on your wall or even teach your little kids some fun educational stuff without using a whiteboard. There are lots of ways to use this device which can only be limited by your imagination. Here’s a list of some applications where the TouchPico can be used. Business: This device can easily replace any expensive non-portable projector. You can easily make sales presentations while on the go. Education: No need for whiteboards and you get the option of having interactive lessons. Gaming: Imagine playing your favorite games on a larger screen. You can use the stylus to play Angry Birds or Fruit Ninja. Creativity: Create your next big idea using this device. Entertainment: Just dim the lights and play your favorite movies. This can be done indoors or even outdoors. You could watch any of your movie collections or simply stream movies from Netflix. Physical activity: You can now do your health related activities while watching its video tutorials. The TouchPico is made up of two parts. One is the projector which is roughly the same size as the Galaxy S4 and the other, which is unique to this device, is the stylus. The stylus is what makes this device different as it allows the user to interact and control the image that is on display. The stylus uses infrared technology which sends data to the built-in infrared camera of the projector. TouchPico is currently running a campaign over at popular crowdfunding site Indiegogo. The goal is to reach $55,000 and with just 5 days remaining in the campaign period a total of $789,459 has already been raised. This device will have a retail price of $499 however you can pledge $99 right now which will guarantee you the device at a price of only $399 (that’s $100 off the original price). The delivery date is expected to be this October.